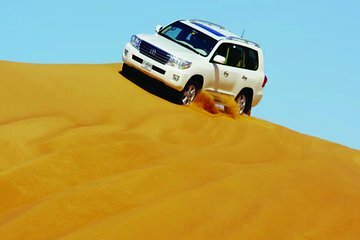 Let loose in the desert on an action-packed, 4-hour morning adventure from Dubai. Travel into the desert in the relative cool of morning and enjoy a 20-minute 4x4 dune bash, with a professional driver mastering the exciting ascents and descents. Then, enjoy a photo stop at a camel farm and try your hand at sandboarding. Feel your adrenaline race as you cruise and carve down the sandy slopes. This morning tour is ideal if you’re booked or simply want to relax during the afternoon and evening. I really liked it. Our guide was a very nice guy, and being almost alone in the desert was much more fun than being one of hundreds of tourists in the evening. I have used Viator on many occasions and found the description very good. However this one was very poor with the description including sand boarding, visiting a camel farm and free refreshments. None of this materialised, it was just a very expensive ride over some dunes in a 4x4 and he got stuck! Poor value for money and not at described. 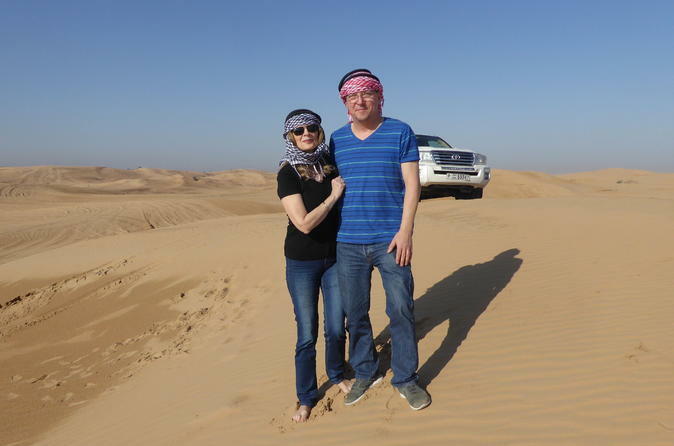 With only a few days in Dubai, we chose the Morning Desert Safari to give us the desert experience without needing to stay for a meal at the campsite as we'd already done a similar thing in Egypt. This proved to be an excellent option because we were the only two on the tour! The desert was so quiet and peaceful. We loved the 20 minute dune bash across the desert, had a great laugh on the short camel ride and enjoyed trying out sandboarding you get 3x goes. Our guide was very friendly and accommodating, not to mention an excellent driver. We'd not hesitate to recommend this tour, particularly if you don't have much time. This tour was just what we needed to experience the dessert in the short time span we had before our flight. Our guide was very good!